Today I found out, before the 17th century, almost all cultivated carrots were purple. 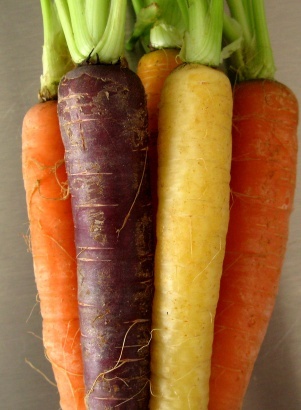 The modern day orange carrot wasn’t cultivated until Dutch growers in the late 16th century took mutant strains of the purple carrot and gradually developed them into the sweet, plump, orange variety we have today. Before this, pretty much all carrots were purple with mutated versions occasionally popping up including yellow and white carrots. These were rarely cultivated and lacked the purple pigment anthocyanin. Some think that the reason the orange carrot became so popular in the Netherlands was in tribute to the emblem of the House of Orange and the struggle for Dutch independence. This could be, but it also might just be that the orange carrots that the Dutch developed were sweeter tasting and more fleshy than their purple counterparts, thus providing more food per plant and being better tasting. It is actually possible to turn your skin a shade of orange by massively over consuming orange carrots. Orange carrots get their bright orange color from beta-carotene. Beta-carotene metabolizes in the human gut from bile salts into Vitamin A. The origins of the cultivated carrot is rooted in the purple carrot in the region around modern day Afghanistan. When cultivation of the garden style orange carrot lapses for a few generations, the carrots revert back to their ancestral carrot types, which are very different from the current garden variety. In ancient times, the root part of the carrot plant that we eat today was not typically used. The carrot plant however was highly valued due to the medicinal value of its seeds and leaves. For instance, Mithridates VI, King of Pontius (around 100BC) had a recipe for counteracting certain poisons with the principle ingredient being carrot seeds. It has since been proven that this concoction actually works. The Romans believed carrots and their seeds were aphrodisiacs. As such, carrots were a common plant found in Roman gardens. After the fall of Rome however, carrot cultivation in Europe more or less stopped until around the 10th century when Arabs reintroduced them to Europe. British gunners in WWII were able to locate and shoot down German planes at night due to radar. What does this have to do with carrots? To cover up significant advancements the Allies made in radar technology at the time, and the extreme effectiveness of radar that resulted, the British spread about an urban legend that said that they massively increased the night vision of their pilots by having them consume large amounts of carrots. This lie not only convinced the Germans, but also had a bonus effect of causing many British people to start planting their own vegetable gardens, including planting carrots. This urban legend has persisted even to this day. The largest carrot ever grown was 19 pounds; grown by John Evans in 1998 in Palmer, Alaska. The Vegetable Improvement Center at Texas A&M recently developed a purple-skinned, orange fleshed carrot called the Beta Sweet. This carrot is specialized to include substances that prevent cancer. It also has extremely high beta-carotene content. Almost one third of all carrots distributed throughout the world come from China, which is the largest distributor of carrots in the world. Following them on gross production is Russia and then the United States. Although the orange carrot was not cultivated before the 16th and 17th centuries, there is a reference in a Byzantine manuscript around 512AD which depicts an orange rooted carrot, suggesting that at least this mutant variety of carrot could be found at this time. scientists have discovered that it is possible to become physically addicted to carrots. It is thought that this rare condition is brought about by dependence on beta carotene. Addicts may develop yellow or orange colored skin on the soles of their feet, palms of their hands and even on the abdomen. Scientists in UK studied one 40 year old male who started to eat carrots when he stopped smoking cigarettes and apparently he was consuming large numbers of them each day. He said that when he was not eating carrots, he couldn’t stop thinking about them. According to reports, withdrawal of the carrots made him very agitated and unable to relax. A 49 year old Australian woman had a similar experience when she stopped smoking and started chewing on large numbers of carrots. Withdrawal caused insomnia, nervousness and irritability. Excessive consumption of carrots as a food fad has been the subject of research, but very little is known about addiction to them. It is known that the anti oxidants in beta carotene which is found in this vegetable, can help in the treatment of other addictions by increasing the ability of the body to transport oxygen around the cells. This has worked well with nicotine addiction, but the case of the Australian woman and her substitution of carrots for cigarettes has led psychologists to suspect that there may be more to this than physical addiction to the beta carotene in the vegetable. I’d have to disagree with you on that one. It’s how the British were able to repel the Germans even though the Germans had about 5 times as many planes and could have annihilated the weak British air force at the time. The Germans thought that the British had a ton more planes than they did because the British would throw pretty much their entire air-force against German attacks every time as they always knew where the Germans were attacking because they had radar and the Germans didn’t, at that time. So the Germans assumed the British must have a very large air-force to be able to commit the number of planes they were to a certain area and still keep the rest of the country protected. Little did they know, had they just sent their full force against the British, they could have crushed them in one battle. Check out the History channel’s documentaries on radar and the British air-force. Carrots give you night vision… Classic! Wow, I love this article. I run a Slovak cooking website and carrots (and also parsley root) are used a lot in our cuisine. But I have never heard of a purple carrot, nor have I seen one. How did you manage to get those multi-colored carrots? Or is that some sort of a photoshop trick? I found purple and yellow carrots in Pike Place Market in Seattle. You can get purple, yellow, white and orange carrot seeds from this organic seed company in the USA. Found some purple carrots at the farmer’s market…Turned my Clam Chowder a nice shade of lavender. They’re sweeter than orange carrots, even a bit beet-like. I grow purple carrots they are just as sweet as orange ones, and certainly have a better flavour, as are the yellow and white ones. The one highest in beta-carotene is the Atomic Red, not orange at all. So I’m not sure about the colour flavour or sugar reference. In lettuce the darkest green like Romaine has the highest Beta-carotene also. Many old varieties of vegetables are not at all like the new varieties; like cylendra beets that are not round but shaped more like a carrot. Hybridization does not give anything a better flavour or increase it’s nutritional content, nor it’s digestibility. What is does increase is revenue from patents, production and shelf-life. I used to have huge gardens in Ontario where I produced heritage vegetables for seed which I sold on line. Back in the 50’s and 60’s Chemical companies bought up a lot of old Seed companies and deleted as many of the old Heritage varieties as they could in order to facilitate their greed. They Created hybrids and of course patents; uniformity in shape, colour and size sacrificing, unfortunately both flavour and nutritional content. There is no comparison between a Cherokee Purple and what you buy in the supermarket. I grow Cherokee Purple in my green house they are perfectly adaptable even here in Newfoundland. So if you ate too many carrots before the 17th Century, would your skin turn purple? I guess it’s the same as if you aren’t too many orange carrots now. You might get purple spots, but lots of the carrots had red yellow or orange insides, and there were lots of white and yellow varieties. Can you still turn carrots purple or are they always going to be orange? The Beta-Sweet carrots occur naturally too. I first encountered purple and yellow carrots today on stony stratford market. Came home to google about them and found this article. They are currently simmering in the pan. Some are orange, some are very pale creamy yellow, some are dark purple all the way through and some have purple skins with orange flesh inside and they all smell so carroty, not like the crap from the supermarkets.